Posted by Michael Scott // July 7, 2015 // Economies, Government. Whether face-to-face or on the Internet, stumbling across people with cool ideas has become a regular occurrence for me; perhaps none more captivating than Alex Marshall, Senior Fellow at the Regional Plan Association in New York and author of the book The Surpising Design of Market Economies. As a self-styled investigator with a libertarian streak acquired early in life, Alex revels in trying to figure out how the world works. His propensity for asking deep questions – and refusing to take no for an answer – comes from his roots as an urban journalist. Through his incessant wanderings, Alex has concluded that the foundations of conventional capitalism are formed by governments. These public entities, he says, form the basis for what we think of as ‘markets’ or ‘business’. 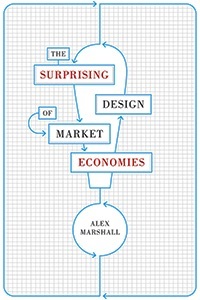 I asked Alex to expand upon the themes covered in his book by exploring ten surprising insights on market economies. Whether you agree with them or not, my hope is that you will find Alex’s views to be thought-provoking and fodder for mindful conversation. Good government is more difficult to attain in the U.S. than in many other countries because there are so many layers to the system. We have state and local government bodies combined with counties, cities, towns, municipalities, school districts, water authorities and other entities. Then we have the federal government overlaying everything. This makes it very difficult for government to be responsive and flexible government. There is no doubt that our system of government could be operated better. As I say in my book, healthcare should be considered a form of public infrastructure: a right like public education. Yet there are certainly so many opportunities to screw it up, whether through government or private initiatives. When you really get down to the nitty gritty requirements of Obamacare, there are certainly numerous opportunities for making things worse. Hopefully, we can have a government that is responsive enough to ensure change in the healthcare landscape. This will likely involve modifying the healthcare system and continually working at it until we get it right. In my youth, I was a libertarian. That was very appealing to me at the time because like many young people, my life was all about freedom and liberty; a variation of “Don’t tell me what to do.” I read the works of Ayn Rand and other writers who were libertarian in their outlook and who espoused the notion that you can do what you want and let the market take care of everything. While that all makes sense, it falters when you really probe at its roots because in reality, a libertarian society currently doesn’t exist. I’ve now moved past libertarianism, although I’m still kind of emotionally libertarian. I still don’t like the idea of government telling people what to do or restricting them. At the same time, we are a cooperative society, one where we need to work together politically, not just in the marketplace. We’ve got to make laws and policies and do so collectively, lest we end up with a dictatorship – something most people want to avoid. If they really indulge in self-examination, a lot of libertarians might come to the conclusion that they’re actually anarchists. The idea of getting rid of all government in favor of a society that organizes itself without a government, sounds appealing. It’s an interesting idea, but I don’t know if it’s feasible. There is definitely a thread of socialism in my book. Personally, I am in favor of an economic concept called a mixed economy, where some things are handled socialistically and other things privately. Libraries, for example, are pure socialism because we have collective access to free books; all you need to have is a library card. While a few libertarians have a problem with this, most love libraries and their appeal. And from an author’s perspective, libraries are actually not so bad because they purchase a lot of books, often at the full market rate. The same goes with public libraries, schools, water, and roads. We are richer as a society because of all of this public infrastructure. While the current economic climate has been trending toward the public, there is an incredible environment of creativity in private business that I would hate to see squelched. That’s why I am a staunch advocate for mixed economies; private business for creativity and entrepreneurial initiatives, aligned with a government that works well and does good work also. That’s the utopia that I envision. I believe that this is a false concept because markets are underpinned by governments. You can’t have people buying or selling something without government creating the basic structure and the systems that make this possible. In the end, markets don’t exist without a government setting it up, running it and regulating it. Yet an exclusively pro-government view can be awkward and sluggish because the public sector tends to wield the club rather than paintbrush. It’s really a fascinating thing. Cities are not just considered corporations, they are corporations. Historically, corporations have functioned as an artificial body or person created by state government. Cities are one of the oldest forms of corporations and actually have a much longer history than the private corporations we tend to think of today. In a sense, Google and the City of San Francisco are both the same thing, both being corporate bodies created by the state. IBM, Apple and other private companies are descended from the type of corporations that created cities. So it would behoove us to remember that corporations are essentially government creations, created with the intent of benefitting the public. And instead of regulating corporations, the focus should concentrate more on designing them better.